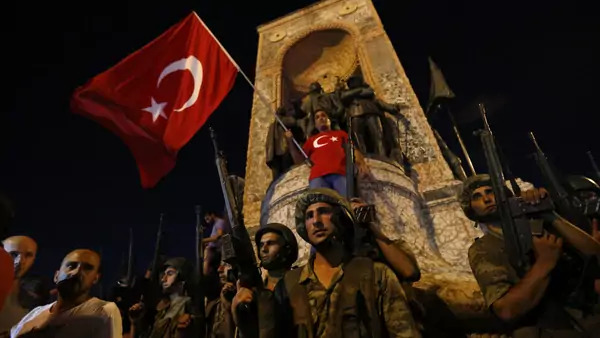 Turkish military stand guard near the the Taksim Square as people wave with Turkish flags in Istanbul (Murad Sezer/Reuters). This article was originally published here on Foreign Policy's website on Friday, July 14, 2017. President Recep Tayyip Erdogan survived the attempted coup in Turkey one year ago this Saturday, but the aftermath has been ugly. A purge that the government had begun well before the failed putsch accelerated and has since ruined the lives of more than 200,000 people and counting. In mid-April, the government staged a referendum on the powers of the presidency. The “yes” votes carried the day, but barely. Observers from the Organization for Security and Cooperation in Europe indicated that it was unfair. There are 177 journalists in jail, including Kadri Gursel, a reporter who has been imprisoned now for more than eight months over absurd and contradictory allegations that he is both a supporter of the Islamist cleric Fethullah Gulen and the Kurdistan Workers’ Party (PKK), a decidedly secular terrorist organization. On July 9, Kemal Kilicdaroglu, the leader of the main opposition party, finished a 280-mile march for justice in protest over the purge that culminated in a massive rally. His supporters declared that a new day had dawned in Turkey, but the next day 72 academics were purged from Bogazici and Medeniyet universities. In the broadest strokes, these are the grim facts of the last 12 months in Turkey. But what has happened since last July is part of a bigger story about Turkish politics and society. Erdogan’s merciless purge has Turkey watchers, journalists, and policymakers debating how the country arrived at this unfortunate moment. For many Turks and observers, the problem is Erdogan and his ruling Justice and Development Party (AKP) with its religiously tinged authoritarianism. They are correct, but that explanation only goes so far. Turkish politics had been defined by repression and blood well before the AKP. The AKP era can be divided into roughly four periods. There were the good Erdogan years, from 2003 to 2007, when Turkey undertook four constitutional reform packages, European Union membership negotiations began, and, according to the World Bank, the economy grew between 5 and 9.6 percent. But after the AKP won 47 percent of the popular vote in 2007, its commitment to reform broke down, and Erdogan’s authoritarian tendencies became increasingly manifest. After the June 2011 general election, another AKP electoral success, Erdogan began pursuing a brazen policy of polarization. Prior to the election, Erdogan had purged the AKP of its liberal wing and afterward dropped whatever pretenses he had previously maintained about a societal consensus around the AKP’s agenda, breaking the broad coalition that brought the party to power. These few years elided with the last period, which began with the violent suppression of the Gezi Park protests during the summer of 2013, and placed Turkey on its present authoritarian trajectory. At each stage, it seemed that Turkey’s transformation — for better or worse — was well underway. But was it? How deeply have Erdogan and his ruling party really changed Turkish politics and society? The AKP has no doubt made a mark, but stripped of the particularities of the party and its leader, there are some similarities between the current era and previous ones. A large part of Erdogan’s appeal to many Turks was his determination to undermine the authoritarian structures of the Turkish national security state that the Kemalist elite used to suppress their opponents. Instead, he has merely substituted the old authoritarian institutions for ones of his own, intimidating and destroying the media, universities, and the military while persecuting individual journalists, academics, Kurdish politicians, police and military officers, and followers of Gulen. As Erdogan went after his opponents, he invariably enjoyed a reservoir of support and not just from his large constituency. For the rest, there was jail, no matter the lack of due process or semblance of justice. Balakian is entitled to his anger, though perhaps he paints with too broad a brush. There are many Turks who want to shed light on that period and reconcile themselves to the crimes of the pre-republican years, without resorting to phony commissions of carefully selected historians. Politics and nationalism have made that impossible — which speaks directly to Balakian’s diagnosis of the problem of genocide denial and offers an explanation for how Turkey has come to its current profoundly repressive moment. Consider the fate of Turkish journalism. A large number of reporters rot in jail, while others are in exile, and still more live in fear. The Turkish media always varied in quality, but now in the place of actual journalists, editors, and columnists are people who can be counted upon to be foot soldiers in the AKP’s information campaign. This sorry state of affairs is connected to the unwillingness of much of Turkey’s elite to engage in self-reflection. Years before, when Erdogan began jailing journalists unfriendly to his agenda, other reporters, editors, and columnists friendly to him and his party, especially his then Gulenist allies, cheered him on. After a breakdown in relations between Gulen and Erdogan in 2013, the government began destroying the Gulenist media. The placement of newspaper and televisions stations into the hands of government-appointed receivers was not met with outrage but rather something akin to glee by figures who profess to defend the rule of law and democracy. The Gulenists’ opponents — like the Gulenists themselves, in an earlier era — chose revenge over due process, blind to the dangers this presented to Turkey’s political development. The government and its supporters made the same mistake last July, immediately after the failed coup. Before an investigation could even begin, Turkish officials settled on an account of events that millions of Turks seemed to accept without question. Many of Turkey’s best and brightest — both at home and abroad — took Erdogan’s version of events at face value, something they were never before willing to do. There was no doubt a sense of justice when the alleged coup plotters (all said to be Gulenists) were rounded up after a night of violence that saw the killing of more than 250 people and the bombing of the Grand National Assembly. But the maniacal purge that followed has ensnared more than 200,000 people, ruining their lives and those of their families. Where is the justice in that? One could argue, of course, that the recent March for Justice, which reportedly attracted some 1 million people by the time it reached Istanbul, represents the sort of self-reflection that Balakian lamented was so sorely missing in Turkish society. It was certainly a positive development and a triumph of sorts for opposition figures like Kilicdaroglu. While he had previously been unable to put Erdogan on the defensive, his walk from Ankara to Istanbul under the banner of “justice” was a stroke of (accidental) brilliance. But placed in context, Kilicdaroglu’s inspiring procession of resistance looks altogether different. Kilicdaroglu shares responsibility for Turkey’s deepening authoritarianism: He threw his support to Erdogan in the aftermath of the coup and has, until the March for Justice, meekly opposed the purge. Moreover, he only decided to undertake the march because one of his own party members, Enis Berberoglu, was jailed under a provision that suspends parliamentarians’ immunity under certain circumstances, notably terrorism. But Kilicdaroglu and his party had supported that measure, which initially targeted Kurdish politicians. When he made his triumphant speech on the completion of the march in Istanbul, Kilicdaroglu did not seem interested in justice for everyone. He took the opportunity to lash out at Gulenists in a manner similar to that of Erdogan. Followers of Gulen and Kurdish terrorists may very well be guilty of various crimes, but Turkey is supposed to be a country of laws. It is, but instead of rule of law, there is rule bylaw. Clearly, both the country’s current leaders and the opposition — based on Kilicdaroglu’s rhetoric — feel comfortable weaponizing the Turkish legal system for their own gains regardless of the consequences. The unwillingness to engage in self-reflection is not a specifically Turkish quality. It is found everywhere, but in Turkey it has nurtured a certain kind of cynicism, hypocrisy, and dogmatism that makes the continued denial of the Armenian genocide and the pathologies of the past year in Turkish politics possible. Turkey’s political elite are defined by acute sensitivity to any affront, both real and imagined, and a chauvinism that demands the world weep for the people who were killed during the coup and at the same time rejects the genocide and justifies the purge. In rising to Turkey’s defense in this way, however, they are denying truth and justice.